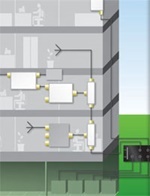 Frequency expansion drives increasingly complex and more costly broad-band DAS solutions. Leading DAS Designers are now beginning to offset some of this cost by using Signal Tappers in place of more costly Directional Couplers. Microlab now offers the highest-performance/most cost-effective Signal Tapper solution available on the market. In this webinar, the concept of the Signal Tapper will be introduced. This webinar will also include an analysis of the performance characteristics and recommended design revisions that will enable tremendous cost savings without any sacrifice to over-all system performance. This webinar has ended and is available in the archives area.